I’ve really been enjoying the Hogarth series where modern writers rewrite Shakespeare Plots (I reviewed Anne Tyler’s Vinegar Girl earlier this year). Margaret Atwood’s retelling of The Tempest is superb. I found myself rooting for Felix, who’s been ousted from his position as the Artistic Director of the Makeshiweg Festival and ends up teaching Shakespeare in a prison. The title comes from one of the insults in the play. Felix has his actors make a list of all the curses in the play, and then insists they only use the ten they select as a class for any future cursing. The result is endearing–all these tough guys using Shakespearian curses. The way Felix exacts his revenge seems fitting and not terrible, in the end. The play, of course, isn’t a tragedy the way other Shakespearean plays are. 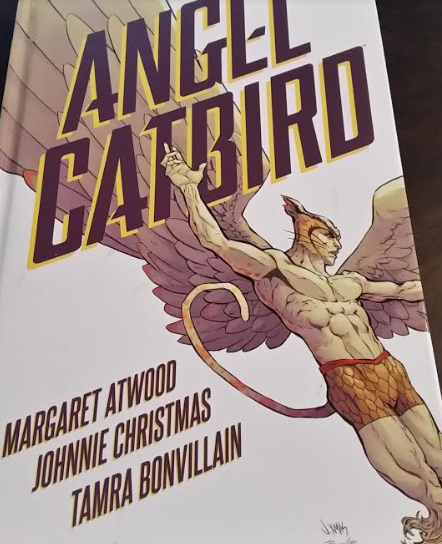 What I particularly enjoyed in this version was the way Atwood allowed for the characters to have life after the play. The final assignment for the actors is to imagine life after the performance, and that may have been my favorite part, especially for Miranda. The end is heartwarming and offers readers a sense of completion that doesn’t seem unreasonable. So even if you’re not a fan of The Tempest, you should pick up a copy of this story, as it allows for redemption, forgiveness, and healing for many of the characters. Want to be festive on Monday, but don’t want an elaborate costume? Try some of these old classic plays on words, or a new classic. 1. Ceiling Fan: Wear a shirt that says Go Ceiling! and wave a pom-pom. You’re the ceiling’s number one fan! 2. Blackeyed Pea: Cut out a large P from construction paper, pin it on your shirt, and blacked one eye. Who says you can’t be Fergie? 3. 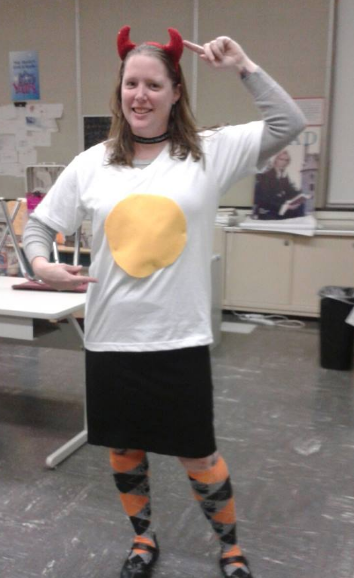 Deviled Egg: Wear devil-horn headband along with a white T-shirt with a yellow circle of felt or construction paper pinned on it. 4. Smartypants: pin some smarties candy to your pants. You can hand them out to others throughout the day. 5. David S. Pumpkins. I know this isn’t a pun, but for some reason I just can’t stop watching this Tom Hanks skit from Saturday Night Live. All you need is pumpkin-print apparel. I had a student bring in this massive book, drop it on my desk, and tell me in no uncertain terms, that I had to read it. I’d just recently read Let the Great World Spin, also recommended by a student, so I needed something epic and something engaging. I took it home, and proceeded to fall asleep reading it for the next week. I just never wanted to put it down. I even graded early to clear my schedule so I could spend a few hours on it one night. I enjoy reading female comedian biographies. For example: Lena Dunham’s Not That Kind of Girl ; Tina Fey’s Bossypants; Amy Poehler’s Yes Please; and Mindy Kaling’s Is Everyone Hanging out Without Me? But Amy Schumer’s The Girl with the Lower Back Tattoo was my favorite of ALL of those books. Probably because I have the most in common with her–we’re close in age, and we’re both introverts. I know, you’re probably thinking how is Amy Schumer an introvert (something I often hear). and her response is this: “Sitting and writing and talking to no one is how I wish I could spend the better part of every day.” Now that is something I can relate to for so many reasons. What surprised me (and it shouldn’t have) was how much her life has colored her comedy. After reading this, watching Trainwreck made more sense, as it was semi-autobiographical. Her honesty about how difficult it was to negotiate her father’s illness and other personal issues was authentic and really fascinating. Also, this book is just so empowering for women of all ages. Take, for example, this excerpt: “I know my worth. I embrace my power. I say if I’m beautiful. I say if I’m strong. You will not determine my story. I will… I am amazing for you, not because of you. I am not who I sleep with. I am not my weight. I am not my mother. I am myself. And I am all of you.” While this is not a book I would hand to many students, there are a few seniors who would embrace this book a nd I think it would speak to them. But it is also enjoyable as a read just for people who want to read about the experience of a single woman in our culture. Having an authentic audience for writing can inspire students to invest more time into their work. Rewards don’t hurt, either, and some of these contests have monetary prizes attached. These are for the fall 2016.
Letters About Literature: This contest prompts students to write a letter to an author: “stating how reading his or her work changed you. Be personal but also persuasive! Support your ideas with specific details, including details from the work itself. This is not a fan letter but rather a reflection on how an author influenced you.” Grades 4-12 can enter. First deadlines (for 9-12) are December 1. Scholastic Art & Writing Awards: This prestigious contest “The Scholastic Awards look for work that demonstrates originality, technical skill, and emergence of a personal voice or vision.” The deadlines vary by region, but the contest is open NOW. JFK Profiles in Courage Essay Contest: “The Profile in Courage Essay Contest challenges students to write an original and creative essay that demonstrates an understanding of political courage as described by John F. Kennedy in Profiles in Courage. January 4, 2017. Creative Minds Nonfiction Writing Contest. “Essays may be any work of creative nonfiction including, but not limited to, memoirs, personal essays, travel writing, and lyric essays. We will not accept book reports, critical works, or research papers.” 5:00 pm ET on Thursday, November 3, 2016. There are plenty more contests for your students, these are just contests I have vetted and my students have submitted to and had success with writing and submitting. Posted by Kate, PCTELA Blogger. Margaret Atwood, one of my favorite writers, really can do anything. 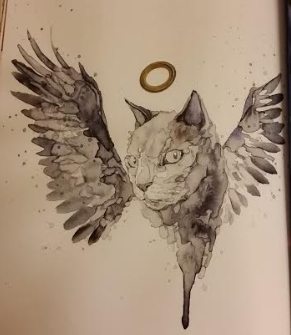 Not only can she write fiction, poetry, and essays, now she’s conquered the graphic novel market with her new book Angel Catbird. NPR ran a great story about this which gives you some background, and the forward to the book also offers insight into her youthful drawings and her inspiration. She says “we all have unlived lives” and the graphic novel made one of her unlived lives happen. Let’s hope, like all cats, she has plenty more lives for us as readers. The basic premise is typical superhero origin story: Strig Feleedus drops his experiment, and his DNA merges with a cat and an owl. There’s a rat-villain who runs the laboratory where he works, and he finds some other cat-humans who help him out. The playful writing made me laugh out loud a few times–she doesn’t shy away from cat puns at all. The drawings, by Johnnie Christmas, are delightful, and I, for one, cannot wait until the next volume is released. For more reviews of Margaret Atwood’s work here on PCTELA’s blog, see Negotiating with the Dead , a book on writing, and The Tent, a book of short essays/stories (one of which works really well when teaching Hamlet–it is Horatio’s version of events after the tragedy), and finally, Stone Mattress, a collection of short stories. Posted by Kate, Blog Editor for PCTELA. This past weekend, we held our annual English Teacher Conference at the Penn Stater in State College, PA, and as we reflect back on the speakers, presentations, and professional conversations we experienced, we want to invite you to consider submitting a proposal for next year’s conference. It will take place October 20 & 21 in the Doubletree in Greentree, PA, right outside Pittsburgh. We’ve secured Laurie Halse Anderson as a keynote speaker! So think about how you might pull together a presentation addressing Acquiring Advocacy: Overcoming Obstacles, Promoting Partnerships, and Cultivating Dignity. As teachers today, one of the most important lessons we must continue to learn is that our student’s voices need to be heard. With the influence of technology, we need to assure our students that face to face interaction is important and readily available. Parents, teachers, and administrators are a (real) life partners and not a virtual presence. That very presence is vital to how our students learn and succeed—and can be fostered through advocating for ourselves, our students, and our schools. While the success of our students is important, we also need to consider that their success is dependent on our ability to connect, teach, engage, and motivate. We can only help them to be their best selves when we, too, are engaged. Connecting with each other, speaking into policies, and staying aware of the needs of our students are all ways in which we can advocate and be advocates. How can we cultivate a welcoming and safe atmosphere for students, parents, and the community? What ways can teachers collaborate with administration, staff, and parents to help our schools and students thrive? What techniques can we use in the classroom to promote meaningful engagement and self-reflection in ourselves and our students?